Okinawa Prefectural Assembly passed ordinance to regulate the use of sediment from outside the prefecture with a majority on July 13. 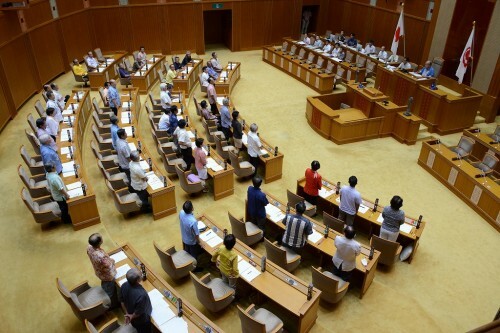 On July 13, the Okinawa Prefectural Assembly passed an ordinance to regulate the use of sediment such as soil and stone from outside the prefecture passed in a majority. The ordinance was proposed by the ruling parties. Members of the ruling parties and the New Komeito favored it, while members of the opposition, made up of the Liberal-Democratic Party and Japan Innovation Party, disagreed with it. The ordinance will be enforced from November 1. It will affect the use of sediment for landfill for construction projects, including the construction of a new U.S. base at Henoko, Nago, which is part of a replacement of U.S. Marine Corps Air Station Futenma in Ginowan. In debate prior to the vote, members of the ruling and opposition parties expressed opinion on whether to favor or oppose the ordinance. Dai Shimabukuro (LDP) expressed the opposite opinion: “It has a political objective to block the building work for the new U.S. base. It is not for the purpose of preserving the nature of Okinawa. Only two days have been given for deliberation. We have not heard opinion from municipalities and citizens.” He claimed that this should have been treated as a matter for extended deliberation.